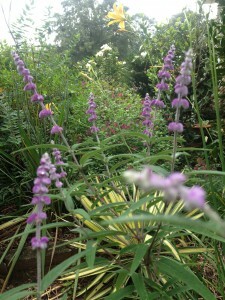 Perennials – Plant Some Now! First things first…what is a perennial? Well, a perennial is any plant that will be with you for the long haul – some will disappear completely during the coldest months of the year and reappear with the first warm days of late winter. Herbaceous perennials have a specific bloom period when they offer their largest show, then continue to grace the garden with their foliage the rest of the season. 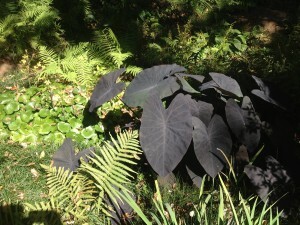 Or, their foliage will be the show through the summer and their bloom time will be in fall. However and whenever they bloom though, please understand that for the majority of their life you’ll be looking at the shape, texture and color of their leaves. When you’re deciding where to place them this is one of the most important things to remember! 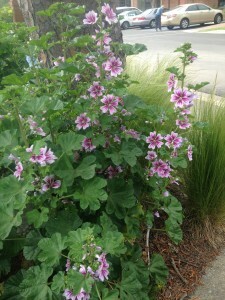 However, perennials are not no-maintenance plants. Some, like Japanese aster, thread leaf coreopsis, catmint and dianthus need shearing back after bloom. Others, such as daisies, coneflowers and rudbeckias appreciate general dead-heading (Cutting off individual blooms.) to keep them blooming longer. When they’ve finally played out the entire stems need to be cut to the ground. Butterfly weed, Asclepias tuberosa, benefits from deadheading blooms if you don’t want it to reseed. Monarch butterflies lay their eggs on it, so deadhead below the bloom only. Still others benefit from being cut back by at least half early in the season to control height, or this can be done with half the plant to create a staggered bloom time. Many late season bloomers fall into this category. These include many of the tall salvias, perennial sunflowers, tall rudbeckias, pink muhly grass and joe pye weed (Eupatorium). These late blooming perennials are quite beautiful in combination with perennials grasses. 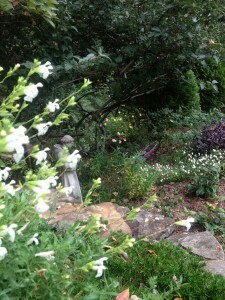 Summer phlox is one that benefits from up to half its stems being cut back early in the season. This promotes good air circulation, which in turn helps to prevent mildew problems on the leaves. None of these tasks is difficult, and, if they’re done a little at a time, your plants will look well tended and cared for. If you’re in the Birmingham area, please stop in and take a look at the perennials in stock now. The selection of plants is excellent! Solomon’s seal (green or variegated) – Polygonatum sp. Don’t let the latin names intimidate you! They are just the best way of knowing for sure what you are asking for. Common names, though easy to remember, can bring on even more confusion when there’s more than one plant with the same name…at any rate, try a few perennials in your garden soon – you’ll be hooked in no time! This is just the beginning of the perennials that are out there. Ask us for advice if you need help choosing – we’re happy to advise you on the right choices for your garden. And, if you’re adventurous, try one even if you’re not sure if your spot is exactly right – plants don’t always follow the rules! This entry was posted in Perennials, Uncategorized and tagged butterfly weed, catmint, coreopsis, daisies, daylilys, dianthus, ferns, french hollyhock, herbaceous perennials, hostas, japanese aster, joe pye weed, maintaining perennials, mexican sage, muhly grass, perennial sunflower, rudbecia, salvia, summer phlox on May 1, 2013 by Kris Blevons.